For a limited time, Portal is free on Steam. 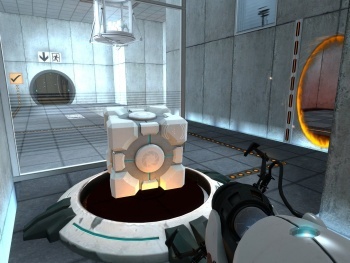 Let's face it, you've almost certainly played Portal by now. It's been out for four years, after all, and it's responsible for creating at least two of the most popular memes on the net. But if you've been living under a rock or just really haven't been paying attention, then the news I bring is good: Portal is now free. Believe it or not, Valve says it's giving the game away in order to help spread the word about its educational potential. "It's eye-opening to see how videogames can be used in amazing and unexpected ways to help educate our next generation," the company said in a statement. "Using interactive tools like the Portal series to draw them in makes physics, maths, logic, spatial reasoning, probability, and problem-solving interesting, cool and fun, which gets us one step closer to our goal-engaged, thoughtful kids." "Today, innovative educators are finding ways to incorporate Portal and Portal 2 into their classrooms-helping teach physics and critical-thinking skills," it continued. "One of the biggest challenges in teaching science, technology, engineering, and maths is capturing the students' imaginations long enough for them to see all of the possibilities that lie ahead." Which is a lovely sentiment, kids, learning, shining hope for the future, blah blah and all that, but the important thing is that Portal is free! Until September 20, that is, so if you haven't yet sampled the delights of Aperture Science, GlaDOS and sweet, sweet cake, you might want to get on it. Snag it for either the PC or Mac at Steam.